I've had my eye on this little book for a while. Initial thoughts: 'this is so cute, small and pink!' Better yet - a book for the working women by a working woman. This 'Little Black Book' is so small (only 115 pages), it can easily be finished within a day. It's packed with tips and extremely handy info that women will need being their own boss, or even working in a company. I found this book to be an enjoyable read. What I really liked about it is that it is written in a conversational tone, so it feels like getting advice from an older sister who has 'been there and done that'. As a creative person, working in a creative field, I sometimes find the business aspect of work a little bit difficult to balance with the creative part. It was really nice to find that I'm not the only one. It wasn't long before I'd tabbed my favourite pages to go back and read over in future. I have to admit that the practical guidance in the book was extremely invaluable. What sort of advice is in the book? 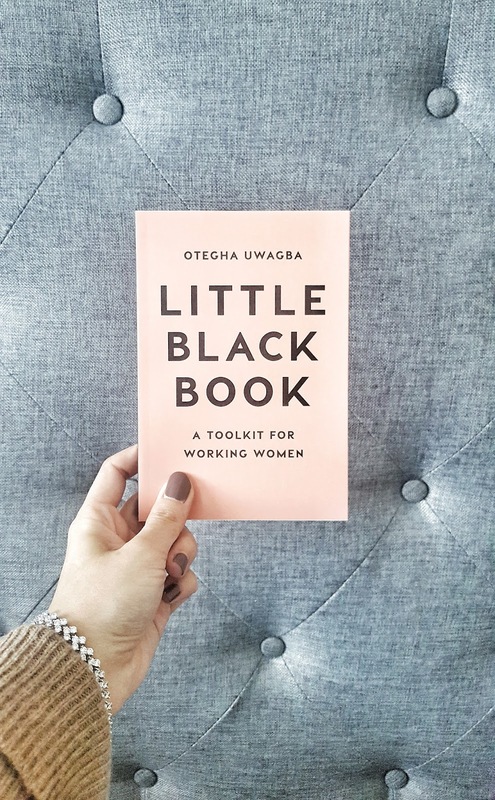 The advice you'll find in the 'Little Black Book' is varied, from 'ways to maximize your productivity' to 'getting paid what you deserve'. Not all the advice is something I need, BUT it is interesting enough to want to learn it as I don't know when I might need to use some of these tips. In the world now I believe that unless you're working a 9-5 rigid structured job, you can learn different skills during different periods. This book definitely takes that into consideration, offering varied advise. Money talks, knowing your worth. Now you ladies are probably thinking 'Hm, she only thinks about money...' And my answer is: yes we all should. I won't lie, it is one of the most awkward things about working for yourself. Sometimes it even feels like a taboo to speak about. Now imagine my relief when I read more about how you should be pricing, your personal time if you should be working for free, budgeting, dealing with late payments and so much more! All in quick paragraphs that get straight to the point and are easy to understand. Back to school, how and why to learn new skills. I am all up for learning new skills! But sometimes I do think that it's just me procrastinating (if you know what I mean). I was excited to see that there was a small chapter in this book about just that, giving me the perfect excuse to find something new to learn! Q&A, Words of wisdom from some inspirational Women. My favourite chapter, packed with words of wisdom from inspiring women on what they have learned. I've found myself flipping through these pages over and over again to find a gem each time I read it. "My motto is 'forever forward' which is all about always moving forward, forgiving yourself for mistakes, and being a proud work in progress... recognizing that you have put in the work in order to progress." Be in this together. Be with each other. Respect all industries and work they entail, even if you don't understand them. Collaborate-cross-pollinate each other with your skills and experiences. Make friends. I would advise any working woman, whatever the job you have. The book's general theme and target audience are the creative working women, but I think the advice handed out is more than helpful for everyone, even men! This sounds like my kind of book! I'll have to find it. Thanks for sharing! You are very welcome. I do hope you buy it. It is an excellent book. Yess, please do read it. It is a quick read. I must admit I haven't had the time to read at all for ages ! I think this book will be worth a read. Do you have a link to a digital version? Thanks! I'm going to hunt down this book because, not only is your review a convincing one, I thought the same as you when I first saw it... its just pink & small... i need this in my life! Lol .... hope to find it in Dubai! Yes hopefully you do find it in Dubai, if not you can get the digital copy of the book. I think i just find my online sister in you, hehe, lovers of pink and small books. I seriously need to borrow this book. Looks so good! Love how it gets straight to the point, and it's so important to hear from people's experiences. Do come over to my place and take the book when ever you need my love. I think you will enjoy the read. In Sha Alalh you will love it. Definitely a book I need to read. I am especially curious about the pricing yourself chapter as thats personal issue I am dealing with right now. The pricing is always a personal issue, sometimes we need to hear from others what is okay and what is not when it comes to pricing. Especially from another lady lol. Your blog is amazingly beautiful!!!!!! Do you have a link to the digital version? Or where to purchase it? I would like to read it! If you get a chance to, you must read this book. Its small and compact and can be finished within one sitting.